An Easter craft & ten things you can do with plastic eggs. OK, so it’s a little early to be thinking about Easter. Way too early for me, as I thrive on the last minute rush. Well, maybe thrive is not quite the right word, but last minute is often the way we roll around here. I’ve been writing a couple of Easter craft tutorials for Kidspot and so I’ve got into the Easter frame of mind a little earlier than usual. This year, here in Victoria, Easter is at the end of the school holidays which gives us a good couple of weeks of school holiday time to get into some Easter themed crafting with the kids. For the next six weeks I’m going to be posting lots of Easter craft ideas. This might also include some re-posting of a few from the FGB archives for all of my lovely new followers who might have missed them. If you have a gorgeous Easter craft to share, I’d love to include some guest posts. I found these adorable clear plastic eggs at my new favourite, locally based, packaging supply store, Pack-it-in. 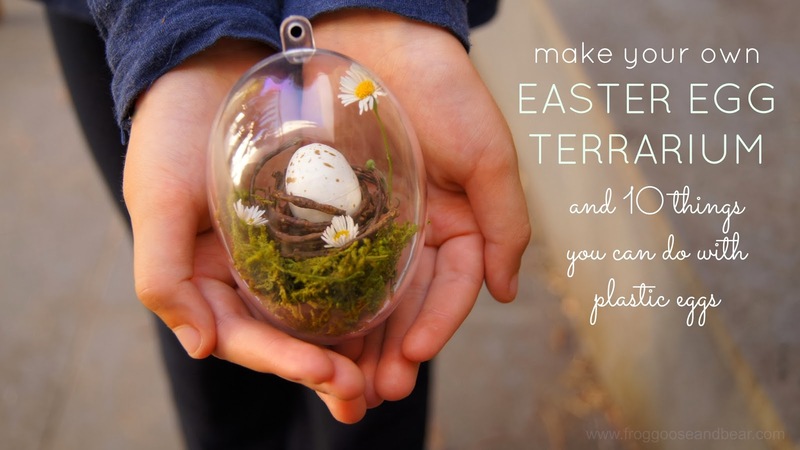 We made these Easter egg terrariums using fake moss and flowers, some foam eggs (purchased here) and made the nest using florist wire. The possibilities of what you could put inside these as Easter gifts is endless! I particularly like that they lend themselves to non-chocolatey goodies. I can imagine colourful confetti, balloons and mini streamers just for a colourful explosion of fun, filled with mini toys or a little game or activity like those we put in our bon-bons. I actually found a list here of 40 non-candy items that fit inside a plastic egg. I couldn’t resist including the photo above. Little Miss Frog was feeling a little ignored as I was taking photos in the courtyard and it took me a while (observant parent that I am) to notice the cheeky faces she was pulling in the background. Have you started thinking about Easter yet? Have you got any awesome Easter craft ideas? I’d love to share them with FGB readers, so shoot me an email and we can organise a guest post! You don’t have to have a blog to do this either. you might like to head to the FGB kids craft page. I&#39;ve definitely been thinking about Easter crafts, but mostly for work – I&#39;m an Activity Director at a skilled nursing facility, so I&#39;m generally a month or two ahead with my holiday planning. I&#39;m really excited to try the egg shaped rice crispy treats with my residents, maybe when we do our creative inter-generational groups with a local homeschool association! oh these are sooo sweet. I nearly dies when I saw Easter eggs in the shops though – when did that sneak up on us?? I adore these and am frantically trying to source the materials to make them. Ideally would like to find empty egg shells in nature but that&#39;s not so easy. Really beautiful creation, well done you!